With the increasing tests count and complexity, it will be even more critical that the tests are more maintainable. A significant part of this effort is the easier troubleshooting and better support for locating errors. BELLATRIX help you with full-page screenshots and video recording together with detailed log reports and rich test running information and failure analysis. BELLATRIX automatically creates a full-page screenshot if the test fails. One of the best ways to detect what was the cause of the test failure is to see a screenshot of the web page at that moment. At least 50% of the time, action is happening in the invisible part of the screen since the web pages are more than one screen long. BELLATRIX screenshots show the whole page – even the invisible parts. To use the feature, apply the ScreenshotOnFail attribute to your test class. If the test fails a screenshot is saved in the location you specified in the configuration file. BELLATRIX automatically saves a video recording if the test fails. Another great way to see what was the cause of test failure is to watch a video of the whole test execution. Since only the visible part of the screen can be recorded, video recording can be combined with the scroll to visible feature. If it is enabled in the configuration, before performing an action on an element, BELLATRIX scrolls until the element is visible on the screen. Another enhancement of the videos is the highlighting of elements. Before each action, the element is highlighted, which makes it easier to spot later in the videos. To use the feature, apply VideoRecording attribute to your test class. Sometimes it is useful to use your functional tests to measure performance or just to make sure that your app is not slow. To do this, BELLATRIX libraries offer the ExecutionTimeUnder attribute whereby you specify a timeout. If the test is executed over it, the test fails. Detect if there is a problem in the test or a bug in the system without looking into the code or debugging. BELLATRIX detects if the app was currently deploying, the page is missing, or there was a server error. You can add your own checks too. 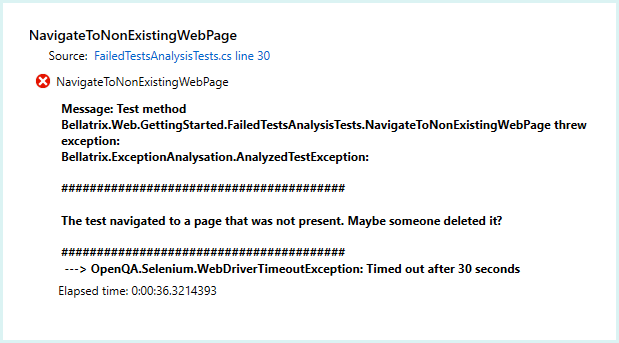 In case BELLATRIX detects that there was a problem, an explanatory message is displayed for test failure reason.